© Bruce Nauman / 2018, ProLitteris, Zurich. Photo: Jürgen Buchinger, © Raussmüller. From the outside, Bruce Nauman’s Floating Room looks like a large cube hanging down into the building from above – unpretentiously constructed and with no aesthetic aspirations. The surrounding area is relatively dark, or at all events not illuminated in the way we are otherwise used to in art spaces. All the more striking, therefore, is the bright strip of light that flows out across the floor from beneath the walls of the suspended structure. Interested visitors look for its origin and discover a door in one wall. As soon as they have stepped over the threshold, they find themselves in an unsettling situation. They stand – alone – in an empty, square room with high, white-painted walls and bright, cool lighting. 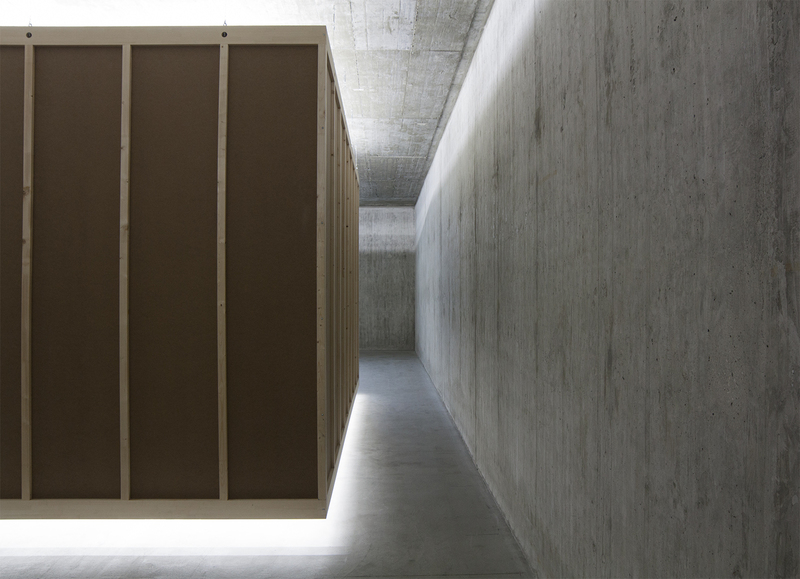 The supposed cube has no ceiling and no floor; their standpoint is the level of the room outside, above which Nauman’s construction is suspended by six inches. Visitors look in vain for a point upon which they might be able to fix their gaze, but the white walls around them offer no distraction. Even the door closes firmly and without a handle. The visitors walk about in order to situate themselves – as if they might gain a better overview from the middle of the room. But the bright fluorescent lighting produces a flicker that seems to rob the construction of its clear form. The walls no longer give the impression of solid surfaces and the position of the recipients becomes unstable. The elevated lower edge of the room suggests a transition to the floor where there is none, and the visitors inside experience the growing feeling that the security of their standpoint has been taken away. Few works of art override the position of the viewer as concisely, directly and decisively as this Floating Room. With no other means than the simple presence of the empty, brightly lit room suspended above the floor, emotional reactions are produced in those who enter. Not only is there nothing to look at in the almost 20 metre square room, but there is also nothing demonstrably absent. Even the space outside is incorporated – an effect that is rather disquieting, however. Under these circumstances, the perception of the viewers is inevitably drawn to themselves. They recognize that it is they who form the focal point of this work: they are the exhibited “object”, as it were, and find themselves involuntarily confronted with their feelings. They may well feel reminded of an experiment in which the psychological stability of the test subjects is gauged in terms of the degree of their response to a state of exposure. Whatever the case, some recipients react to the situation set up by Nauman as if they were resisting unwanted manipulation – something thoroughly in line with the circumstances. 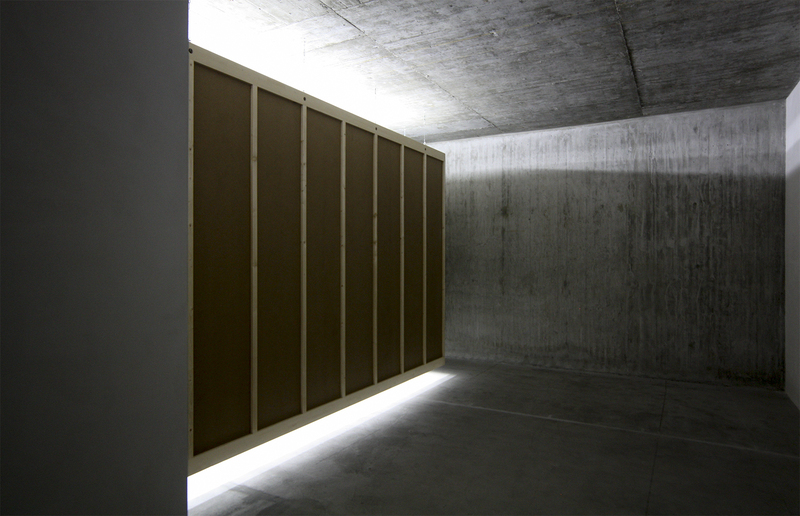 From 1984 to 2014, the Floating Room was permanently installed at the Hallen für Neue Kunst in Schaffhausen, Switzerland – the institution which Urs Raussmüller created specifically for New Art and which he ran jointly with myself. Prior to this, the work had also been exhibited at a number of international locations, including twice at Raussmüller’s InK in Zurich.1 The powerful effect that it exercised in all sites was also an interesting reflection of visitors’ expectations – including the way in which these were shaped by artistic developments. 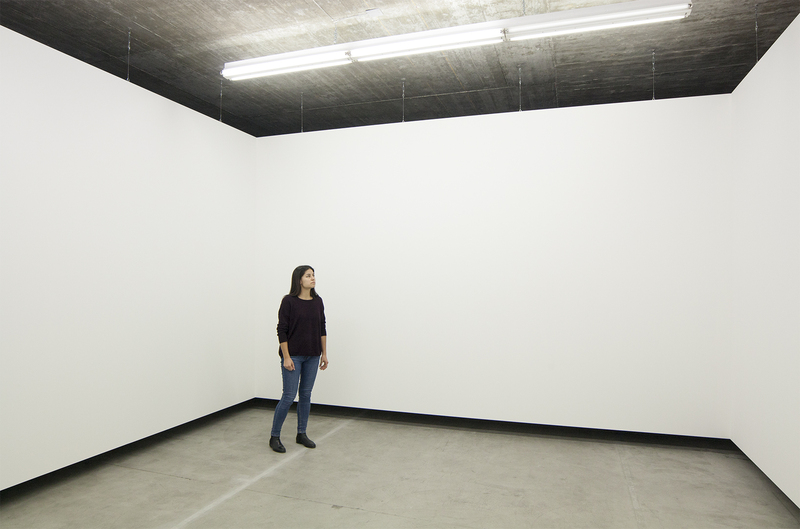 People who looked at the Floating Room in terms of Minimal Art, for example, were struck first and foremost by the work’s cubic shape and its placing in space. Those, on the other hand, who viewed it in the context of the works with light by (other) West Coast artists, such as Robert Irwin and Maria Nordman, were particularly interested in the bright strip of light beneath the room’s dark exterior. Most recipients, however, reacted from no other perspective than their own, and in ways that surprised them. As part of an event at the Hallen für Neue Kunst, we focused on their experiences and invited visitors to talk about their emotional responses to the Floating Room. It was astonishing how varied these were. One man talked about feeling as if he was in an interrogation situation, exposed and “X-rayed” in a hostile environment. He had to leave the room again quickly so as not to become aggressive. At the other end of the spectrum, one woman would happily have spent even longer in Nauman’s “protective space”. It made her feel increasingly better, she explained, because she was finally alone with herself, without having to give her attention to other people or things. For her, the Floating Room had the calming effect of a place of refuge. This in turn astonished the other visitors, who spoke more about feeling insecure and uncomfortable and who found the gap between the walls and the floor extremely unsettling. An 11-year-old girl said that after a short while she felt as if the ground was sinking beneath her feet and she was falling downwards out of a room. For another guest, it was the opposite: he had the impression that the room detached from the floor was pulling him upwards – as if he could shake off gravity. Nauman’s work acted on him like the starting point for a concentration exercise. We were impressed at how diverse these reactions were, and indeed how contradictory, whereby in all cases strong feelings had been registered at the physical and psychological level. Nauman’s Floating Room seemed to leave no one cold, and the discussion about its impact was long and animated. None of the visitors remained indifferent or uninterested – something that truly cannot be said of many artworks. Hallen für Neue Kunst, Schaffhausen with Bruce Nauman, Floating Room: Lit from Inside, 1972. © Bruce Nauman / 2018, ProLitteris, Zurich. Photo: Fabio Fabbrini, © Raussmüller. Bruce Nauman followed – as he had already been doing – his own path. He took note of what was going on in studios and galleries (primarily through the art magazines he read), and was receptive to other artists’ methods and materials, where they interested him. But he drew inspiration for his own approach chiefly from creative spheres outside fine art. What particularly concerned him was the physical communication of extreme situations, the triggering of a sense of consternation through targeted impact on the perception, and, most fundamentally of all, the structuring of processes as methods of generating and transferring tension. He found these themes expressed in music, dance and literature more than in fine art – and felt himself challenged all the more strongly to translate them into physical works, too. What conspicuously distinguishes Nauman from the majority of artists is his astonishing wealth of invention in the use of materials and media. In each work his approach is based anew on the endeavour to give an idea that interests him a convincing form – independent of solutions already explored. He then deploys his means according to the economic principle of achieving a maximum of immediacy and effect with as few material resources as possible – whereby in the case of Nauman’s later works, the principle of this approach is relativised by the complexity of the technique employed. But a pronounced interest in craftsmanship, too, always lies behind the production of his works. Unlike LeWitt’s option that “ideas alone can be works of art”7, the idea as such is not the goal; rather, Nauman needs it as a stimulus, in order to be able to address himself to its translation into physical form. The precision for which he thereby strives is often not aimed at perfecting the outer appearance of the finished object, but always at the work’s functioning as the trigger of specific reactions. In our art system based on categories and classifications, Bruce Nauman is generally described as a conceptual artist – perhaps because of his formal independence and the importance of the “right” idea as a driving force for his creativity. This classification, however, does not properly reflect his practical activity and the variety of his works in terms of their appearance and content. As Nauman candidly remarked: “[…] the reason I became an artist, I assume, is because I like to make stuff. So I always go back, at some point, to drawing or making something.”8 We might also add that, with this “going back” as part of his process, he in each case creates a new starting point for his continuous advance. Bruce Nauman, Drawing for Floating Room, 1972, graphite and watercolour on paper, 58.7 x 73.8 cm, Raussmüller Collection. © Bruce Nauman / 2018, ProLitteris, Zurich. When the art critic Jan Butterfield, talking to Bruce Nauman about works including the Floating Room, wanted to know whether the artist could build pieces that he had not (yet) realised merely in his head, without needing to finish them, Nauman replied: “Well, they almost always need to be built or mocked up or whatever, because they always change quite a bit.” And to Butterfield’s next question as to whether he had been mocking up the rooms in his studio, he responded: “Usually it is the only way I can get a feel of the scale and the size.”9 Nauman’s studios were not enormous. But he built his works – or their prototypes – in each case in the dimensions in which he had visualised them. His constructions generally correspond to the usual size relationship between a person and their surrounding space. This principle of proportion is a condition of their effect: it is only against the familiar situation created at the outset that the sense of unease which Nauman induces through his art can be measured. With new works he usually tested his own reaction first of all. Once he felt he had achieved the balance between expectation and surprising effect that lent the piece the desired tension, he extended the field of his verification to exhibitions. Sometimes he was then obliged to recognize that he triggered reactions in gallery visitors that led not to a curiosity about the connection between the work and its effect, but instead to a denial of the experience. Yet this reaction, too, affirms the power of the works, insofar as it testifies to a sense of insecurity felt by the viewer. Bruce Nauman built his room-size Floating Room with sheets of wallboard, wood and wire, as an unadorned architectural sculpture. The fact that he raised it off the ground and hung it from the ceiling of the installation space was – independent of the function of this work – a step that furnished the category of sculpture with an unusual mode of action. The separation of a three-dimensional object from its usual location, floor or plinth, represents a disconcerting interference in the convention of the ancient art form. It challenges our perception and changes the relationship between work and viewer, who no longer occupy the same, grounded position. Nauman was not the first artist to suspend works in space, but in the case of his Floating Room – unlike in Alexander Calder’s playful mobiles, for example – the principle of “floating” contradicts the character of the solidly built work. Without calling into question the static construction as such, it conjures the surprising impression that the weight of the object is dissolving. 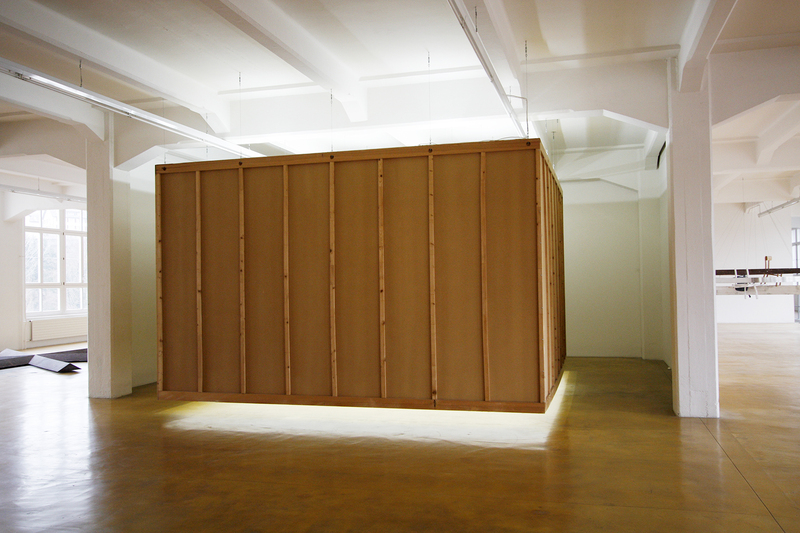 The large room with its heavy wooden walls suddenly appears light: it “floats”, while the recipient remains earthbound. Raussmüller Hallen, Basel with Bruce Nauman, Floating Room: Lit from Inside, 1972. When Nauman talked about the Floating Room, he usually did so in the singular and meant the Lit from Inside version, which he had shown at Castelli’s in 1973. The large construction became archetypal of the idea of an architecture which is in disharmony with its users and which causes a disturbance through a subtle undermining of expectations. The simplicity of its means and the directness of its impact make the work a point of reference in Nauman’s oeuvre: the Floating Room is the epitome of an empty space that generates tension despite its emptiness. When Nauman says: “I don’t think empty rooms are ever really empty. I think we subconsciously put our emotions into them”15, it makes us think of the powerful feelings that surface in the Floating Room: Lit from Inside. The work was exhibited in numerous locations and, from the beginning, was also reproduced in illustrations in international publications, whereby these photographs can never adequately convey the full effect of the room floating mysteriously on the outside and oppressively on the inside. 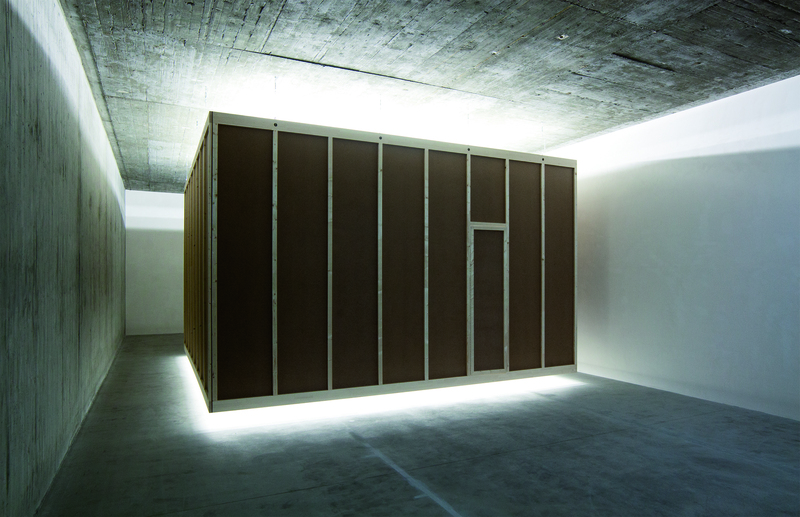 Later in 1973, after its exhibition in New York, the Floating Room could also be experienced at the Fine Arts Gallery of the University of California in Irvine and subsequently at Contemporanea in Rome.16 Urs Raussmüller, who purchased the work shortly afterwards, continued to show it in exhibitions, before giving it a permanent place for thirty years in the Hallen für Neue Kunst in Schaffhausen.17 At the end of 2017 he installed the Floating Room in the Raussmüller Hallen in Basel, whereby he linked Nauman’s construction with a room more compellingly than ever before. The architectural setting heightens the spatial effect, and the tension between light and dark, between the closed nature of the interior and exterior, charges the surroundings as a whole. The recipients find themselves already incorporated into the situation even before they have experienced the Floating Room as such. They realise that the work extends fundamently beyond the object as such and condense the phenomena of light and space into an all-encompassing whole. InK, Halle für internationale neue Kunst, Zurich with Bruce Nauman, Floating Room: Lit from Inside, 1972. © Bruce Nauman / 2018, ProLitteris, Zurich. Photo: Archiv, © Raussmüller. A lot has been written about Nauman’s interest in cognitive and behavioural psychology and his exploration of phenomenology and awareness in the years around 1970. He read with interest Frederick (Fritz) Perls’ writings on Gestalt therapy,25 in which he encountered his own ideas and experiences of the connections between a person’s feelings and their behaviour, and of their perception of themselves and their surroundings. What also interested Nauman in this literature was a question that was particularly close to his own heart, namely how certain tasks are to be structured in order to yield effective results. What Nauman never did, however, was translate what he read literally into works. He accepted certain findings as a creative challenge and, for the themes that interested him, developed forms that made it possible to convey them to others. As a rule, the appearance of his works is without forerunners – just as his subjects, too, are for the most part unusual, even if they lend expression to elementary states of being. In other words, Nauman does not deliver proofs, but has reached findings that have served to enrich art precisely on account of their formal and thematic otherness, and have provided a source of inspiration for many artists. When Bruce Nauman showed the Floating Room: Lit from Inside at the Leo Castelli Gallery in 1973, he accompanied it with an exercise for the visitors that indeed calls to mind Frederick Perls. Perhaps because he was not yet certain what effect the room would have, and perhaps, too, because he didn’t want people to misuse the situation and “make their own performance”28, he gave visitors a set of instructions on what to do. But he was probably also interested at this time in how to act on the recipients’ awareness through verbal commands, and how to stimulate their ability to imagine their physical and mental situation. Whatever the case, his text reads like the procedure for a scientific experiment, which seeks to enhance the viewer’s direct physical and psychological experience of the work with an additional intellectual complication. It reminds us of the reaction, already mentioned, of the visitor at the Hallen für Neue Kunst, for whom the Floating Room was the instrumental precondition for an exercise in concentration. exactly halfway between each pair of parts. We want to move our center (some measurable center) to coincide with such a point. We want to superimpose our center of gravity on this point. Save enough energy and concentration to reverse. Nauman later dispensed with this text; it was evidently a separate affair. It tied the Floating Room to the rigid, self-imposed directions to which the artist had adhered in his earlier actions, and overlaid the powerful effect that the room exercised as such. Reflecting on the installation at Castelli’s, Coosje van Bruggen likewise concluded: “Because of their emotional disparity, the writing and the piece worked against rather than with each other.”30 But she also wrote that, despite this discrepancy, the room functioned in a way that ultimately always led the visitor to end up in the centre. The reason for visitors to move into the centre was probably less the conscious process of centering the self (Nauman spoke of having made “centering pieces”31) than the familiar need for security in a strange setting. As the artist observed: “The more time you spent in the room, the harder it was to think about leaving […] It became much safer to stay in the center of the room, because you became anxious about the dark space outside of it.”32 In an exhibition institution, it is perhaps less the fear of the space outside than the sense of being alone in an unsettling situation. Either way, in a room that is raised off the ground, we are unlikely to stand in a corner, but will place ourselves in the middle of the construction in order to try to control as far as possible its effect on our state of being. For such is the pinpoint accuracy of this effect that we can only evade it by leaving the room. In stepping over the threshold, we escape outside, which – after the experience of being inside – we perceive as an exterior space perhaps for the first time. We may ask ourselves why Nauman was so interested in the fundamental feelings of security and insecurity that he built entire rooms in order to bring these feelings to a wider consciousness. It is clear that he wanted to delineate boundaries and create divisions in order to trigger in others, too, the sense of isolation and exposure he knew from his own experience. Walls can protect, but they also prevent us from escaping. We must face the situation in which we find ourselves, even if we did not seek it. 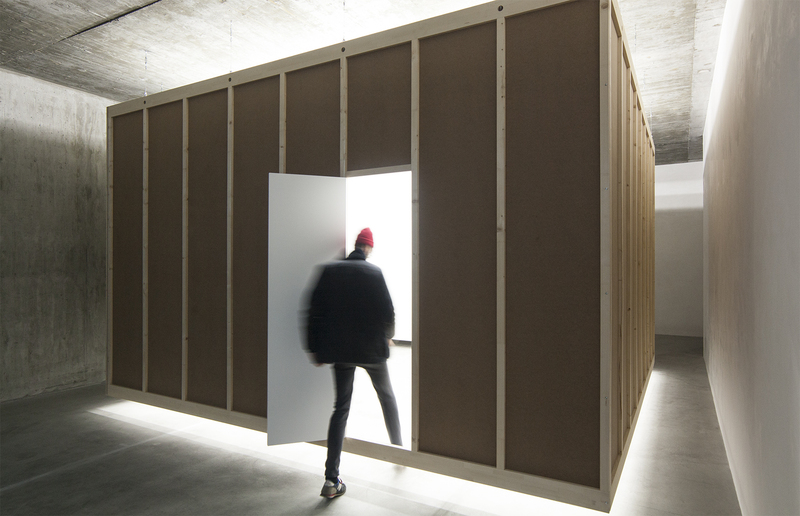 As evidenced by the reactions of those who experienced the Floating Room at the Hallen für Neue Kunst, this retreat into seclusion may feel oppressive or liberating, depending on the individual. As well as making us think about the relationship of the individual to the many, and about a form of escape that is also a form of capture, the situations that Nauman creates at times also call to mind very personal circumstances – Scenes from a Marriage, for example.33 In 1968 Nauman had created a work of extraordinary intensity, which gave shape in disturbing fashion to the despairing cry: Just get out of my life! He had filled an empty room with the sound of his voice, mercilessly repeating – in every shade of emotion, from imploring to aggressive – Get Out of My Mind, Get Out of This Room.34 In this acoustic piece, the exterior space becomes the extension of an inner state, and the command, fluctuating between plea and order, pierces the recipient to the core as the expression of a deep wound. Whether we feel ourselves directly addressed in this dreadful situation, or have the impression of being witnesses to a state of desperation, makes no real difference: the drama unleashed by disharmony between people and communicated by a shattering voice in two short sentences profoundly affects us and sends a shiver down our spine. Bruce Nauman went on to explore the theme of rooms further. Floating Room: Lit from Inside is the first of his architectural pieces which surround people with walls and can be entered through a door, and which are placed inside an existing room. With its size, emptiness, white lighting and suspended position, the Floating Room embodies a form of artwork that focuses with relentless emphasis on the emotions of the (isolated) recipient, and offers nothing to distract them from their state of mind. In 1973, one year after creating the Floating Rooms, Nauman exhibited a triangular room at Konrad Fischer’s premises in Düsseldorf. This room was also accessed via a door, but had a triangular footprint, was illuminated inside with yellow fluorescent lighting and was not elevated above the floor.35 The artist had already deployed coloured light as an alienating factor in his corridors, and he confessed that he found it very hard to stay inside the yellow room for long. But he also said: “What really interests me, is what it is about certain spaces that makes us feel uncomfortable, and what do we do and what emotions do we have when we sense a room is not right. I didn’t want to escape that condition. I wanted to go right to it.”36 He took the recipients with him. For Nauman, towards the end of the 1970s, the enclosed room became a vision: he built sculptures as models for works of architecture which, in his imagination, he located below ground and thus sealed off from everything. Depending on context they are corridors, safe rooms or vast tunnel systems. With the idea of subterranean constructions, Nauman created a form of art that, once again, can be compared with nothing produced previously. The unorthodox aesthetic of these expansive works, and their unconventional connection with the surrounding space, make them – irrespective of their conception as models – a new phenomenon in the broad field of sculpture. Some of the objects made of plaster or fiberglass and polyester resin are attached to the ceiling of the installation site, while the majority are mounted on small blocks of wood, so that they, too, seem to float above the ground. The light illuminating the surrounding area consequently falls not only onto but also under the partially colourful forms, and imbues them with a lightness that contrasts with the heaviness of their conception as often dead-end tunnels and shafts. 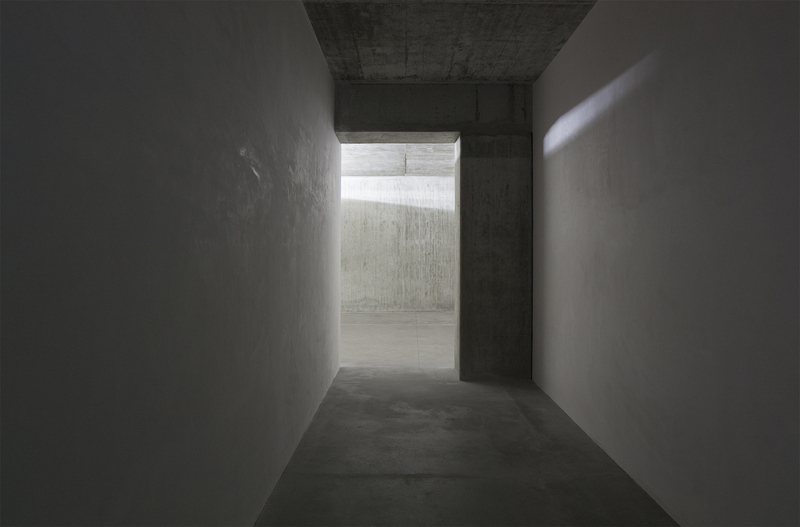 Properties through which Nauman lent his Floating Room its disquieting effect at an early date are found once again, in transformed form, in these sculptures, too – whereby the viewers, other than in their imagination, here remain outsiders. 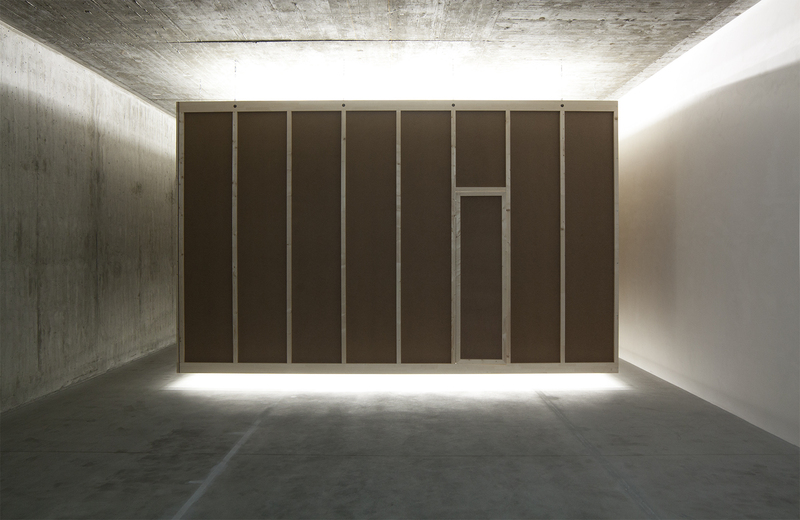 Nauman built the Floating Room: Lit from Inside in order to fill it with light. He raised it off the ground in a dark setting and let the light flow out of it again like a viscous fluid. He later made rooms out of sound, in which a series of unobtrusive loudspeakers form a sort of invisible but effective wall of spoken texts, along which the recipients walk.37 They do not leave the sonorous interior – not just because they are listening, but also because, for all its transparency, it forms an enclosed situation. Through Nauman, the phenomenon of space and its impact on the recipient have indeed undergone an astonishing expansion. We experience his rooms as an extension of our own self, which is reflected back to us by the physical boundaries represented by walls, zones of light and barrages of sound. When we come to discuss these spatial works, it becomes apparent that we lack not only the terms with which to designate their forms of appearance and effect, but also an appropriate name for their recipients. These latter are neither truly spectators, nor listeners, nor mere receivers, since they are actively incorporated into the situations. Yet they are not truly actors either, but affected parties and controlled participants. For however large may be the field of experience they are offered, their own radius always remains extremely constricted. All the more glaring is the realization that the experiences triggered by Nauman’s works can touch nerves that in turn imprint them deeply in our consciousness. This artist has evidently created forms of art for whose reception the terminology still remains to be found. “When I think about doing art, I think about it as an investigation of the function of an artist, or the function of myself as an artist. Each piece of work is the result of what I do in the studio every day, year by year. I think: ‘How do you spend your life being an artist?’ and I attempt to be honest with myself about that, while having some sort of moral or ethical position and some integrity about being an artist. Individual works point at this from different directions, so when you experience a body of work over a long period of time, you get a little more understanding of what an artist is.”38 An artist, Nauman might continue, is a person who interrogates the conditions that determine being human. In contrast to others, he brings forth, from within himself, distinct forms with which his questions – or answers – can be seen and experienced by other people. His credibility and integrity are based on the unswerving continuity of his approach, which is anchored in himself. His own life and experience are thus the motivation for the statements to which he lends form, and the yardstick against which they are measured. These statements in turn reveal, in an unadulterated and comprehensible way, the person who made them. They show the honesty of the artist towards himself or the external influences to which he has surrendered. His works prove themselves vehicles of an attitude that represents (or doesn’t represent) a viewpoint – and thereby strengthens (or weakens) the validity of their artistic statement. The Floating Room is undoubtedly a work born out of the artist’s deep personal sense of an existential condition. As such, it possesses a power of conviction that conveys itself to the recipient. With this architectural sculpture, Nauman has given compelling outward form to the fundamental question of the relationship between a person and the space they occupy, and of the behaviour that these surroundings – with the degrees of unease they can sow – produces in that person. The early work stands at the start of an intellectual and formal process that is provisionally without a conclusion – not least because it reaches, like all the questions that this artist raises in his works, into the depths of the human condition. When Nauman says: “I really mistrust art that’s just about art”39, he distances himself from the many painters, sculptors and artists working with media who are primarily concerned with demonstrating their technical ability, and professes his allegiance to an artistic position that wishes to express (human) truths. Not without reason has he made The True Artist a recurring theme of his oeuvre.40 Nauman’s understanding of art is based on the necessity, with each new approach, of getting to the heart of being human and of thereby lending his works a substance that makes up their – and his – credibility. This is the moral or ethical stance to which Nauman repeatedly refers in his interviews. 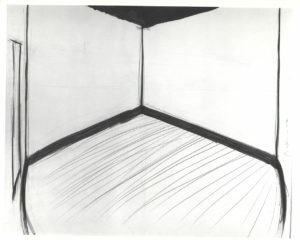 A work such as the Floating Room “points at” this stance and cogently reinforces our experience of “what an artist is”. 1 Franz Meyer opens his text “Bruce Nauman as a Yardstick” in the catalogue of Nauman drawings with the description of a situation in “Urs Raussmüller’s exhibition space InK in Zurich, which put on a Bruce Nauman show in winter 1980/81”; in: Bruce Nauman – Drawings / Zeichnungen 1965 – 1986, Basel, Museum für Gegenwartskunst, 1986; p. 8. Raussmüller has installed the Floating Room as exhibitor or lender on the following occasions to date: 1978 InK, Halle für internationale neue Kunst, Zurich: Bruce Nauman; 1980 Hayward Gallery, London: Pier + Ocean; 1980 InK, Halle für internationale neue Kunst, Zurich: Bruce Nauman; 1981 Rijksmuseum Kröller-Müller, Otterlo: Pier + Ocean; 1984 – 2014 Hallen für Neue Kunst, Schaffhausen. 2017 Raussmüller Hallen, Basel. 2 Coosje van Bruggen, Bruce Nauman, New York, Rizzoli International Publications, 1988, p. 194. 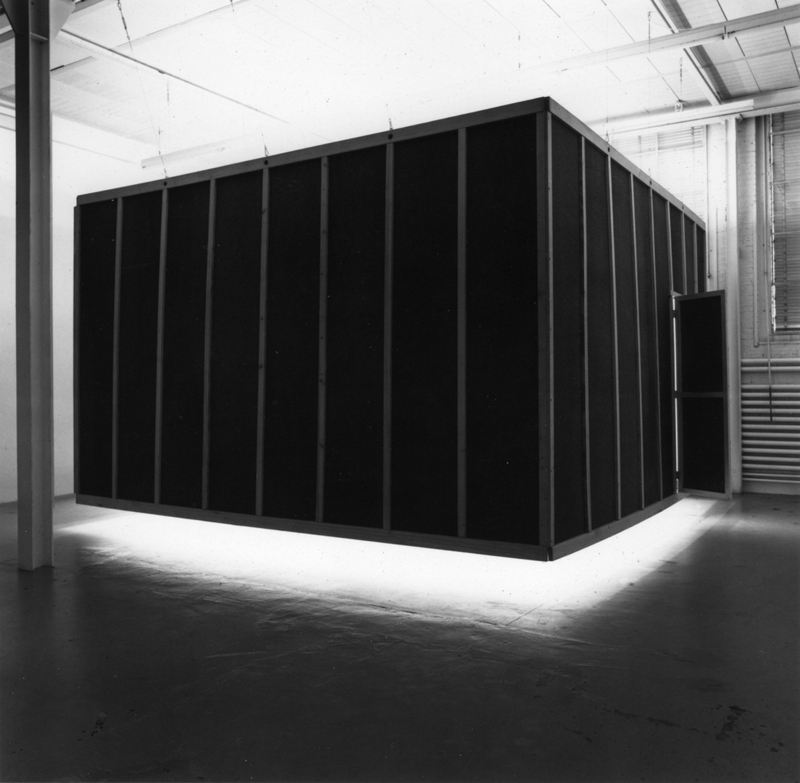 3 Floating Room (Light Outside, Dark Inside), 1972, wallboard, wood, fluorescent lights, 120 x 192 x 192 in. (304.8 x 487.7 x 487.7 cm), suspended 6 in. (15.2 cm) above the floor; in: Joan Simon, ed., Bruce Nauman, exhibition catalogue and catalogue raisonné, Minneapolis, Walker Art Center, 1994; cat. rais. 213, p. 255. 4 Bruce Nauman in an interview with Lorraine Sciarra, 1972; in: Janet Kraynak, ed., Please Pay Attention Please: Bruce Nauman’s Words. Writings and Interviews, Cambridge, MIT Press, 2005, p. 170. 5 Sol LeWitt, Paragraphs on Conceptual Art, in: Artforum, V/10, June 1967. 7 Sol LeWitt, Sentences on Conceptual Art, in: Art-Language I/1, May 1969, sentence no. 10. 8 Bruce Nauman interviewed by Kathy Halbreich; The Museum of Modern Art Oral History Program, 9 January 2012, transcript p. 10. 9 Jan Butterfield, Bruce Nauman: The Center of Yourself, in: Arts Magazine 49, no. 6, February 1975; quoted in: Kraynak 2005, p. 179. 10 See Simon 1994; South America series, cat. rais. 293-295, p. 281/282; Musical Chairs, cat. rais. 313–315, p. 287/288; Animals, e.g. cat. rais. 433-435, p. 321/322; Hanging Heads, e.g. cat. rais. 414-416, p. 317/318. 11 Sciarra 1972; quoted in: Kraynak 2005, p. 167. 12 Michael Auping, Stealth Architecture: The Rooms of Light and Space, in: Robin Clark, ed., Phenomenal. California Light, Space, Surface, Berkeley, University of California Press, 2011, p. 100. 13 Bruce Nauman referring to Floating Room (Light Outside, Dark Inside), 1972; Simon 1994, cat. rais. 213, p. 255. 14 The drawings are reproduced side by side in: Bruce Nauman – Drawings / Zeichnungen 1965 –1986, exh. cat., Basel, Museum für Gegenwartskunst, 1986, nos. 245 – 247. 15 Auping 2011; in: Clark 2011, p. 102. 16 Contemporanea, Parcheggio di Villa Borghese, Rome, November 1973 – February 1974. 18 Michele de Angelus, Oral history interview with Bruce Nauman, 27 – 30 May 1980, Archives of American Art, Smithsonian Institution, transcript p. 39. 19 Butterfield 1975; in: Kraynak 2005, p. 179. 20 de Angelus 1980, transcript p. 54. 21 Please Pay Attention Please, 1973, collage and Letraset, 27 ½ x 27 ½ in. (70 x 70 cm). 22 de Angelus 1980, transcript p. 48. 23 Bruce Nauman, Work from 1965 to 1972, organised by the Los Angeles County Museum of Art (19.12.1972 – 18.2.1973) and the Whitney Museum of American Art, New York (29.3 – 13.5.1973). The exhibition subsequently toured to Kunsthalle Bern; Städtische Kunsthalle Düsseldorf; Stedelijk van Abbemuseum, Eindhoven; Palazzo Reale, Milan; Contemporary Arts Museum, Houston; and lastly San Francisco Museum of Art. Exhibition catalogue edited by Jane Livingston and Marcia Tucker, Los Angeles, Los Angeles Museum of Contemporary Art, 1972. 24 de Angelus 1980, transcript p. 49. 25 Frederick (Fritz) Perls (* 1893, Berlin – 1970, Chicago), psychiatrist and psychotherapist, was the founder of Gestalt therapy. Seminal work: Frederick Perls; Ralph F. Hefferline; Paul Goodman, Gestalt Therapy: Excitement and Growth in the Human Personality, New York, 1951. 26 Sciarra 1972; in: Kraynak 2005, p. 169f. 27 de Angelus 1980, transcript p. 38. 29 Simon 1994, p. 256. 30 van Bruggen 1998, p. 194. 31 Butterfield 1975; in: Kraynak 2005, p. 179. 32 van Bruggen 1998, p. 194. 33 Scenes from a Marriage is a 1973 film by Ingmar Bergman, in which all the nuances of a couple’s relationship find expression. 34 Get Out of My Mind, Get Out of This Room, 1968, audiotape played in a room, 6 min. segment, looped to play continuously; Simon 1994, cat. rais. 113, p. 223. Simon notes that the work has frequently been dated incorrectly to 1972, the year in which Nauman also created the two Floating Rooms. 35 Yellow Room (Triangular), 1973, wallboard, plywood, yellow fluorescent lights, 120 x 177 x 157 in. (304.8 x 449.6 x 398.8 cm); Simon 1994, cat. rais. 229, p. 261. 36 Auping 2011; in: Clark 2011, p. 98. 37 We may think here e.g. of Nauman’s sound installations Days / Giorni at the 53rd Venice Biennale in 2009; see Carlos Basualdo; Michael R. Taylor, ed., Bruce Nauman: Topological Gardens, Philadelphia, Philadelphia Museum of Art, 2009. 38 Bruce Nauman in Christopher Cordes, Talking with Bruce Nauman: An Interview, in: Exh. Cat., Bruce Nauman. Prints 1970–1989, New York, Castelli Graphics, 1989; quoted in: Kraynak 2005, p. 376. 39 de Angelus 1980, transcript p. 32. 40 See Christel Sauer’s essay on The True Artist Is an Amazing Luminous Fountain, 2017/18.